Synopsis: Extremely wet over much of the area, with up to 6.5” (162.5 mm) of rainfall over the past two weeks. Little planting progress on the heavy clay soils of Essex, Lambton and West Elgin. Grower’s mood has remained good, but is starting to turn as June approaches. Crop heat unit accumulation has been good, with accumulations approaching 400 CHU’s. Wheat, weeds, and anything that has been planting are developing quickly. Wheat: Earliest wheat has the first awns showing above the flag leaf. Most wheat is full flag leaf to very early boot, with later planted wheat at second node. 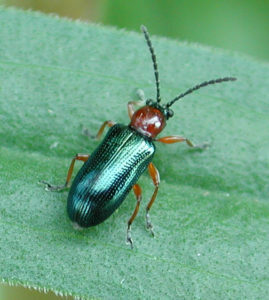 Cereal leaf beetle is reported at higher than normal levels in many locations. Scout! Disease pressure remains low, with no stripe rust yet found and only sporadic reports of mildew or septoria. A significant amount of wheat had the herbicide and fungicide applied last week. Burn has been severe in some fields, and is likely the result of low water volumes. Any herbicide/fungicide tank mix on wheat MUST use 20 gallons of water/acre to avoid burn. Timing is quite late for weed control, at the very end of the label for most herbicides (flag leaf), but should be timed well for the first fungicide (flag leaf). The lack of disease development to date is thought to be due to cool night temperatures over the period. Stripe rust inoculum levels and progression from the south has been greatly reduced this year, likely the reason for no stripe rust being found yet in Ontario. Phosphorus and sulphur deficiencies continue to show up in fields where growers did not address these issues, and will reduce yields. Some manganese deficiency showing in Essex fields (Alex Zelem). 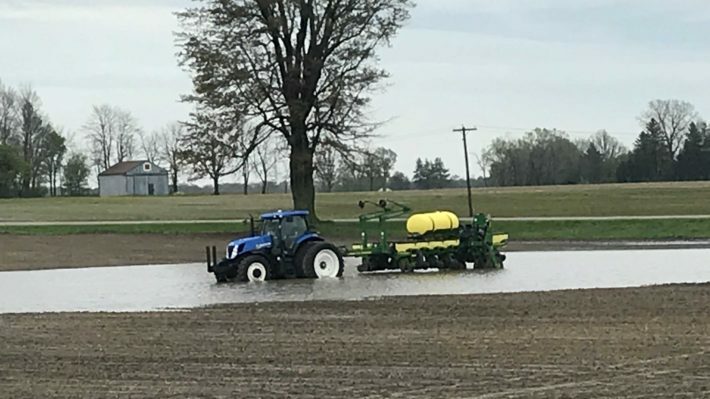 Corn: Corn planting progress varies widely, with 50 to 100% completion on sands and from Middlesex east and north, to zero on the clays of Essex and Lambton. Emergence and stand establishment has been good. Interestingly, corn planted May 1 emerged in 8 to 10 days, with May 11th corn taking 12 to 14 days to emerge, showing how good conditions were in early May (Bob Thirlwall). Some of the later planted stands on marginally fit soils look a bit ragged (Alan McCallum). Earliest corn is at 4 leaf. The date for switching hybrid maturities is quickly approaching: May 25th at London, May 30th at Ridgetown. Any extra long season hybrids should already be switched, and if planting is further delayed, growers will need to consider changing adapted varieties soon (or switch to soybeans). Soybeans: Very few planted in Essex/Kent/Lambton, but good progress in drier areas. Earliest beans have emerged. Weed control: With delayed planting, weeds have gotten huge. Many growers are attempting burndowns if they can get across the field, and recognize that a second burndown may be necessary by planting time. Fleabane has gotten very large and control will be difficult, waterhemp is emerging and populations in problem fields are incredible. With some tomatoes planted and sugar beets up and growing, inversions and drift will need to be carefully considered with dicamba applications. Cultivator misses will also be problematic. Growers will need to use multiple products, applied well, to get ahead of these big weeds. Insects: Lots of adult cereal leaf beetle in wheat fields, far more than normal. Larvae should be visible now or shortly. Threshold is three larvae per tiller before boot stage. After boot but prior to heading, one CLB adult or larvae per stem warrants control.. If significant feeding is taking place on the flag leaf in the early heading stages, control may be warranted. Adults are much harder to count for threshold, as they drop off plants as you approach. Wireworms and grubs are also a concern, with high populations being found in unplanted clay fields as growers look to see if soil is fit. It is the perfect time to scout for wireworms and grubs, if you need to do your pest assessment for next year for class 12 pesticides. Horticulture crops: Tomato planting is very delayed, perhaps only 50% of normal due to wet weather. Sugar beets are in and stands look good. 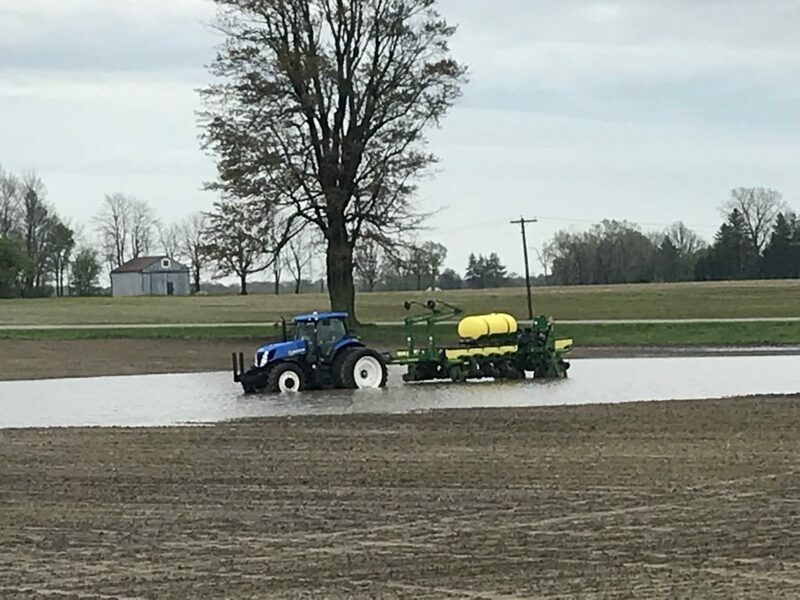 There will be some replants due to ponding and waterlogged soils. Pepper weevil traps are already catching adults. This is quite early (normal would be June timing to catch weevil), and dispersal is over a much larger area than expected, thought to be due to recent high winds. This will be extremely problematic for field pepper growers. Even though there are control products registered, with multiple and overlapping generations effective control strategies just do not exist. Nitrogen: The question was raised about N loss with corn that was planted, all N applied, and then 2 weeks of saturated soils. Denitrification loss is likely to have occurred, but to what extent is impossible to tell. Best management option would be to do a soil nitrate test at 6 leaf corn, and use the 35 ppm threshold approach from Greg Stewart’s work to determine if more N is required. If the soil N test is above 35 ppm, no added N required. From 25 to 35 ppm, add 50 pounds N/ac. Below 25 ppm, add 100 lbs. N/ac. PMRA and pesticide re-evaluation: A lengthy discussion and concern was raised about some of the product re-evaluations conducted by the PMRA. For example, in the case on chlorothalonil (Bravo), re-entry periods for scouting have been extended to 7 days. This is quite a challenge for field crop scouts, and disease monitoring. Many in the group stressed, grower organizations MUST realize that there is a huge opportunity to educate the people that work at PMRA. 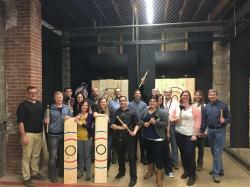 With reasonable high staff turnover rates at PMRA, new staff will always benefit from understanding the implications of decisions that are made. Next Meeting: Ridgetown Agribusiness meetings are held in the Willson Hall Campus Centre (downstairs) at the University of Guelph Ridgetown Campus. Meetings start at 7:15 am with breakfast and every two weeks on Tuesdays. One continuing education unit (CEU) is available at each meeting for Certified Crop Advisers. Next meeting is June 5, 2018.